The BMW M lineup was first introduced in the 1960s. Originally, M, which stands for Motorsports, was meant to represent BMW’s successful racing program. Since 1972, BMW transferred the M moniker to a high-performance, high trim level, lineup of their vehicles. The M-badged cars are designed for track performance, while still embodying the high-quality of luxury that BMW is known for. All M model vehicles include special engines, suspensions, interior appointments, transmissions, aerodynamics, and even exterior modifications. M models stand apart from other cars in BMW’s lineup, and are even track tested prior to going on the market. The newest addition to the BMW M lineup, is the lightweight and nimble M4. Available in both a coupe and convertible body style, the M4 is as exceptional as it is powerful. 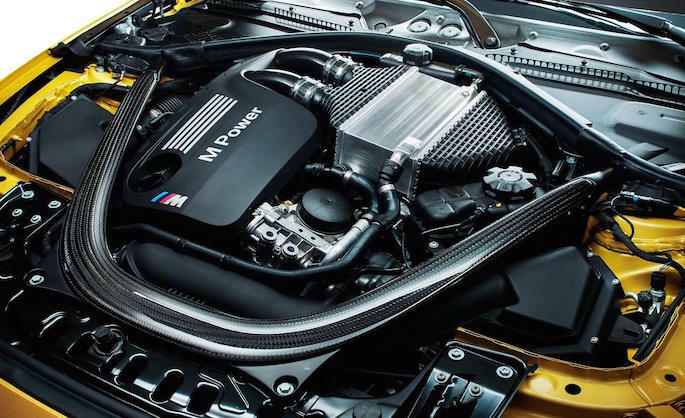 At the very heart of the brand new M4, is an engine with advanced technology to create the ultimate performance experience. Both the Coupe and Convertible variant come loaded with luxury standard amenities, and boast an impressive interior that both drivers and passengers will enjoy. Everything about the 2015 M4 is brand new, and its presence is already making waves in the automotive industry. Nimble, quick, responsive, stunning. These are only a few words that come to mind when BMW’s M4 is brought to mind. Both the coupe and convertible models of the 2015 M4 were carefully designed by top BMW engineers, for ultimate performance and style. The most unique aspect about the M4 is the way in which it was built. To start, engineers crafted the engine brace, the coupe’s roof, and the trunk lid with Carbon Fiber Reinforced Plastic. Not only does this material offer a lightweight solution to conventional steel, it also comes together in one complete piece, for ultimate strength and durability. The new Carbon Fiber Reinforced Plastic technology also benefits the M4 when it comes to performance. The material helps to reduce rotating mass, for a tighter overall drive. The exterior appearance of the 2015 M4 is not just for looks. While the M4 is sure to turn plenty of heads, the new car was carefully designed for ultimate performance, and the exterior is the perfect embodiment of that. The integrated rear spoiler, which is also crafted from lightweight carbon fiber material, features a Carbon Fiber Reinforced Plastic diffuser, which works to keep the vehicle’s weight down, while simultaneously creating rear down-force. Both the coupe and convertible M4 feature 19-inch V Spoke light alloy wheels, chrome plated exhaust tips, and shadowline exterior trim. The convertible hard top is power-folding and retractable, and features an integrated window defroster. The lightweight nature of the new M4, lends itself well to track-worthy performance. The M4 was actually track tested before ever going to market, and can go from 0 to 60 miles per hour in an impressive 4.1 seconds. What makes that possible, is a combination of advanced design, and technology under the hood. Discover a few of the technologies that help the 2015 M4 be as track worthy as all of the other M-badged cars in BMW’s lineup. Active M Differential: Yaw rate, Dynamic Stability Control data, wheel rotation, and pedal position, all act on each wheel independently, prior to any of them breaking free. The advanced electric motor can distribute power between wheels, allowing for automatic shifting in tight turns, and understeer decreases during full-load cornering. Powerful Engine: The turbocharged engine system consists of two TwinPower turbos, that pack enough power to deliver 425 horsepower, and 406 lb.-ft. of torque. Optimal power output is achieved through BMW’s double VANOS technology which works by varying camshaft timing, allowing for high pressure to build inside the engine’s cylinder. Lightweight Components: The M4 features completely redesigned engine components that are lightweight and powerful. BMW engineers helped the M4 shed pounds wherever it could, helping it deliver ultimate performance in every situation. Transmission Options: Whether you prefer a traditional manual transmission, or an automatic, the BMW M4 allows for you to choose either. Drivers can choose between a high-performance six speed manual transmission, or a seven-speed dual-clutch automatic manual transmission with paddle shifters. Either way, the M4 delivers on the same amount of power and precision that it was designed to achieve. Adaptive M Suspension: Drivers can opt for this exceptional suspension, which allows for the driver to choose five different driving modes based on road conditions - thanks to electronically controlled dampers that automatically adapt to changing driving situations. The 2015 M4 may have been built for the track, but BMW did not discount the importance of the interior cabin when designing the newest M model. Both the Coupe and Convertible have different standard features, but each offers the same level of luxury that carries throughout the BMW lineup. The M Sport Seats feature 10-way power adjustable technology, are lightweight, have power adjustable side bolsters, integrated headrests, and a backlit M logo on each backrest. See other standard amenities that come on both the Convertible and Coupe, by exploring below. M4 Coupe - Starting at $64,200, this version of the M4 comes equipped with exceptional standard features. Rain sensing wipers, steering wheel audio controls, HID headlights, navigation system, heated power mirrors, multi-zone climate control, and Bluetooth connectivity, are all included for ultimate comfort and convenience. M4 Convertible - The convertible version of the M4 has a starting MSRP of $72,500, and comes with even more standard features than the coupe. Featuring extended Merino Leather upholstery and door trim, 3-stage heated front seats, four 12-volt power outlets, ambiance interior lighting, and a convertible wind deflector, the M4 Convertible has everything you need to create the perfect atmosphere for a day on the open road. Drivers who crave even more luxury, can choose to include optional packages on their M4. The Executive Package with Neck Warmers enhances the M4 Convertible with features like a full color head-up display, a heated steering wheel, front passenger neck warmers, and a satellite radio. The 2015 BMW M4 is an addition to the BMW lineup that stands up to the German automaker’s M-badge high standards, and will surely be a staple in the M lineup in the coming years.